Anti-Arroyo groups trooped to the Senate on the opening day of Corona's impeachment trial. Cause-oriented groups yesterday (Jan. 16) marked the opening of the impeachment trial of Supreme Court (SC) Chief Justice Renato Corona with a mass action near the Senate. Among those present was political satirist Mae Paner who came as Jus-tiis Juana Change (see video below). 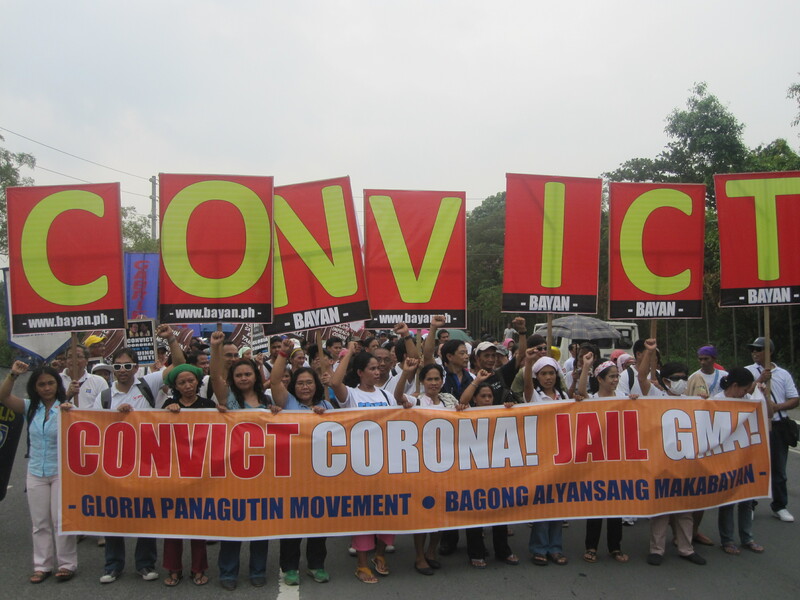 Activists deem the conviction of Corona a positive step in making Mrs. Gloria Arroyo accountable for her many abuses. But they are also warning against a possible scheme by President Benigno S. Aquino III to control the judiciary for selfish political and economic ends. It is important to note that the ongoing impeachment trial of Corona is also happening amid a very real threat of global recession. Given the amount of national attention that is being devoted to this historic trial, which could last for several months, there are valid fears that the country might be caught flatfooted when the impact of the global economic contraction kicks in. But beyond government’s and the media’s apparent preoccupation with Corona’s impeachment trial, there are more fundamental reasons why we should be anxious. For one, the Aquino administration has not put in place an emergency program to ease the blow of the looming recession, much less reorient the economy to substantially address its external vulnerabilities. Meanwhile, the people continue to be impoverished by the defective policies of deregulation and privatization. We greeted the New Year with fresh hikes in deregulated oil prices and privatized water rates. More increases are forthcoming in the costs of petroleum, toll, transportation, power, etc. Social services for the poor like health, education, and housing continue to be undermined with insufficient allocations in the 2012 budget, which as usual prioritized debt servicing as well as the public-private partnership (PPP) program. Violent demolitions of urban poor communities (such as in Corazon de Jesus in San Juan) amid lack of sustainable relocation, and the privatization and commercialization of public schools and hospitals further aggravate the plight of the people. The youth-led Mendiola campout last month tried to highlight these economic issues and engage the Aquino administration but was aggressively suppressed by security forces. In a paper entitled “It’s the economy, student”, Arroyo also tried to draw attention to the deteriorating economic situation under her successor, claiming that Aquino squandered the supposed gains achieved by the economy during her nine-year reign. But reading the paper, the only accurate assertion made by Arroyo is when she said that Aquino “has simply not replaced my legacy with new ideas and actions of his own”. Indeed, Aquino merely continued Arroyo’s anti-people and anti-development legacy of heavy dependence on exports and foreign capital and markets; high prices and depressed wages; lack of social services and privatization; unemployment, job insecurity, and labor export; indebtedness and debt servicing; lack of genuine land reform; dole-outs, etc. that deepen the poverty of our people and backwardness of the economy. Amid all this, there are legitimate concerns that the impeachment trial will just be used by Malacañang to distract the public and conceal its inability, or unwillingness, to address the pressing economic issues facing the people. It does not help that the degree of coverage that mainstream media is giving the trial tends to displace many important issues such as developments in the global economy, its impact on the country, what government intends to do about it, etc. But while the mainstream media tend to focus more on the impeachment trial, an overwhelming portion of the population continues to feel strongly about the economy. The latest (Nov. 2011) Pulse Asia survey on the state of the economy shows that 8 out of 10 Filipinos feel that the economy either did not improve or deteriorated compared to the previous year. The said survey also indicates that economic issues remain the biggest source of the people’s disenchantment with Aquino, and the more bad news for the government is that this trend is worsening. Those who feel that the economy deteriorated more than doubled from 16% (Oct. 2010) to 38 percent (Nov. 2011). The disapproval rating of Aquino in terms of reducing poverty worsened from 21% in May 2011 to 36% in November 2011; on job creation (from 11 to 21%); on prices/inflation (from 21 to 37%); and on wage hike (14 to 25%).